Are you shocked? If so, you’re not alone. The school shooting in Parkland, Florida isn’t the first this year, and sadly, it will most likely not be the last. A lot of people may say, “Now is not the time to talk about making changes to our broken system," but since the Virginia Tech massacre, it has been our mission to build more supportive and compassionate schools to stop violence before it happens. peace (e.g., positive relationships, connection with peers). With the 6th anniversary of the Chardon HS shooting approaching, students wanted to help teachers feel connected and recognized on Valentine’s Day during a month that retriggers many teachers. At River Valley HS and Galion HS (north of Columbus, OH), students are introducing a cross-grade mentoring program to create connection between grades and reduce bullying from older to younger students. Building a mentoring program to create connection and to prevent school shootings. Changing the norm from “kill myself” to “rats” jokes to prevent suicide. Building strengths in middle school students to prevent drug abuse. Showing compassion and appreciation to teachers to help them cope 6 years after their shooting. Addressing school climate problems requires a research-based solution. This year, we partnered with Dr. Dunsmore and the Social Development Lab at Virginia Tech to collect the research data necessary to evaluate our program in schools. We are the first school-based leadership program to provide student leaders with tailored trainingbased on their psychological preference toward promoting kindness vs. preventing violence. We are actively working with two high schools to assess their school climate using student perception surveys and re-assess students annually to explore student development regarding their beliefs and behaviors. Currently, we are working with the Mental Health Network for School Success and the Center for School-Based Mental Health Programs at Miami University in Ohio to explore more research and grant partnership possibilities. Growing, growing, growing. In 2017, we partnered with remarkable organizations and added two new staff members. It takes a village to create culture change, and we are adding to the village. We partnered with seven new colleges: George Mason University, Virginia Commonwealth University, Case Western University, The Ohio State University, Lakeland Community College, Marion Tech & Ohio University Southern. We partnered with notable non-profits, including Sandy Hook Promise, the Josh Anderson Foundation, HESONWHEELS, Family Pride of Northeast Ohio, & Impact Prevention. Miriel Etheridge, an Oklahoma Sooner, works as an after-school mentor in D.C. public schools and facilitates our program in Northern Virginia Schools. 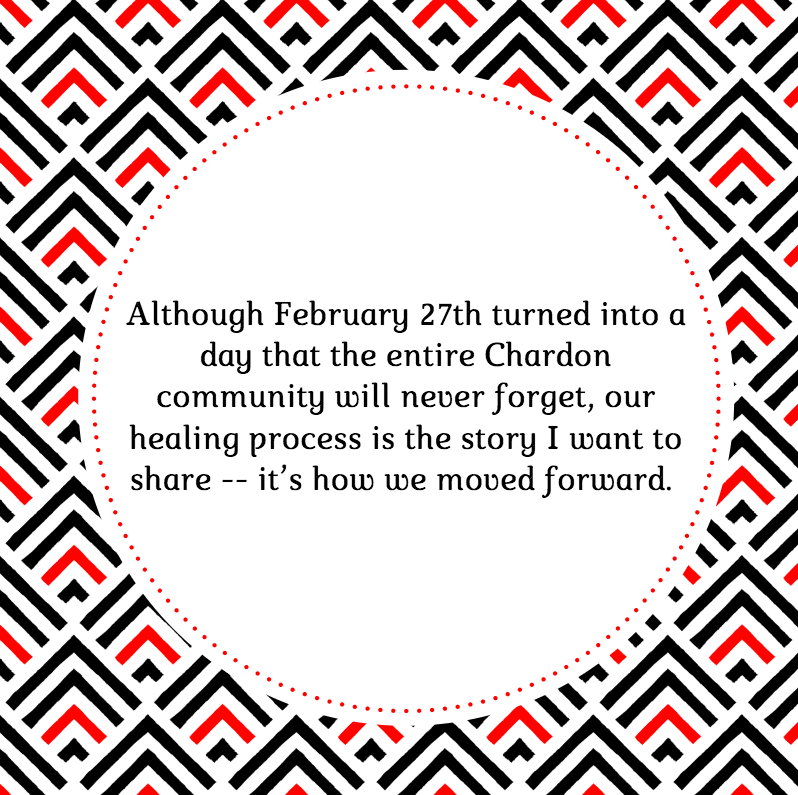 Kaylynn Hill, a Chardon HS alumnus, was a student leader of Actively Caring following the Chardon HS shooting. She has supported our Summits and facilitates our program in Ohio. In partnership with the da Vinci Center at Virginia Commonwealth University, our newest Advisor Somiah Lattimore, and two VCU faculty members taught a design thinking course to VCU students. These students developed brilliant ideas, including a cooperative learning activity and a Virtual Reality exercise to build empathy and stop bullying. Our team wanted to provide you with more updates, so we created a Facebook page. Please give us a like and keep your eyes peeled for more exciting news coming soon! More Schools = More Actively Caring! 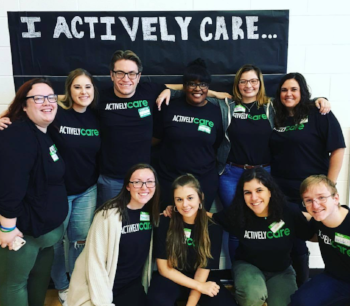 Never a one-and-done program, this fall marked our 3rd year working with leadership students at Falls Church HS, and 2nd year with Centreville HS SGA students to improve their school’s climate. Two Kevin R. Lawall Fellows are working with 7th and 8th-grade students at Hayfield Secondary School, teaching them to Actively Caring and developing character strengths. Our Ohio school partners continue to grow! This fall we’ve trained 140+ students at Vermilion HS to act as upstanders rather than bystanders. We’re breaking down negative social tendencies at Mentor HS by teaching multiple student clubs to work collaboratively, rather than in silos, to improve their school climate. We have some exciting project updates from new and existing partnerships! In partnership with the da Vinci Center at Virginia Commonwealth University, our newest Advisory Board Member, Somiah Lattimore, and two VCU faculty members taught a design thinking course to VCU students. These students developed brilliant ideas, including a cooperative learning activity and a Virtual Reality exercise to build empathy and stop bullying. We want to implement their ideas, but doing so would take financial support. We are in early conversations with Tomás Dorta, a Professor of Design at the University of Montreal, about using his Hyve 3D Virtual Reality technology with high school students to teach social-emotional skills and have first-hand experience upstanding in bullying situations. Using Virtual Reality technology is an outgrowth of the VCU Design Thinking ideas and our extensive network of resources and potential partners. What can enhance the transformational experience of fraternity and sorority life (FSL) for undergraduate students? Relationships. New relationships can change a college experience for an isolated freshman student. Students from an unprivileged background may benefit in a community inundated with privilege (e.g., social capital) needed for upward social mobility. Empowering community members to develop passion for a new cause (e.g., philanthropy) occurs through relationships. We all know relationships are the foundation of families, classrooms, groups, sports teams, organizations, and the fabric of our our society. At Cor, we do not overlook this critical fact, but rather use the science of relationships to improve our ability to facilitate positive culture change. Social Network Analysis (SNA) is a statistical analysis based on graph theory that represents social actors as nodes and their relationships as ties. For example, individuals may be connected through ties of mutual influence (e.g., leadership, power imbalance at school, or roles at work). Groups could be nodes, connected via ties of liking or disliking. Have you ever wanted to know what group (dis)likes each other? Imagine seeing how information exchange patterns (e.g., emails, posts, texts) linked multiple people. The image (to the right) is a representation of social network data in a sociogram. Social actors (e.g., circles in the sociogram) could be represented as different colors because the individuals belong to different groups (e.g., individuals working in marketing, sales, human resources). The size of the circles could be altered based on an actor’s “influence” in the overall network (e.g., larger the node, larger their influence). The color of the lines could be altered based on type of relationship (e.g., like, dislike). We recommend the use of SNA to all stakeholders who may implement our programming because it may enhance the effectiveness of our programs. For example, a study by conducted by researchers at Yale, Princeton, and Rutgers compared school interventions using SNA to identify high-status influencers in middle schools relative to interventions that didn’t target specific students as change agents. The study showed using high-status influencers had a significant decrease in student conflict reports (decrease of 30%) and improved school climate (Paluck, Shepherd, Aronow, 2016). We apply the same science and approach for our FSL program—High Influencer Training (HIT). The HIT program uses SNA to identify high-status influencers in a fraternity or sorority. We then motivate and train these high-status organizational members to facilitate positive culture change based on organizational change theory and prosocial-organizational behaviors. Our training covers developing organizational change strategies and teaching participants how to utilize reinforcement and rewards to facilitate behavior change, to the promoting bystander intervention related to a range of risk behaviors (e.g., sexual assault, binge drinking, hazing) among organizational members. In my first job following ungrad, and then as a graduate assistantship, I worked in Fraternity and Sorority Life (FSL) for three years. During the time, I observed FSL professionals relying heavily on positional (formal) leaders within a chapter to lead organizational change. This ubiquitous strategy is based on the assumption that formal leaders inherit a degree of power and influence with their formal position in the organization. By associating positional power with influence, we spend significant less time with the “invisible” leaders within an organization. Research shows that these “invisible” leaders may hold more influence because an individual’s network of relationship holds more organizational influence than an individual’s formal position in an organization (Simpson, Farrell, Oriña, & Rothman, 2015). What happens when an influential member becomes an “invisible” leader? Their potential to create positive organizational outcomes may never be realized. Our HIT program utilizes SNA to identify the most influential positional and “invisible” leaders. Holding the assumption that influential organizational members have a positive impact on their organizations is dangerous. Such an assumption fails to recognize and respect the power of negative influencers. In fraternities and sororities, it is the high-status negative influencers who encourage and perpetuate a harmful fraternity and sorority culture. In fact, the most dangerous chapter member is the negative informal influencer. Not only are they “invisible” to FSL professionals, but their influence can negate or reverse any positive efforts to develop leaders who want to benefit their chapter or community. By using SNA to identify the most influential organizational members, all influencers—both positive and negative, formal and informal—are included in the positive organizational culture change process. We believe identifying and intervening on negative influencers is essential if you want to change harmful fraternity and sorority life culture. Negative influencers can be empowered to leverage their influence for positive organizational change. It is our belief time can be saved and resources maximized if FSL professionals use SNA in their practice. Is sifting through participant applications the most effective selection process for choosing the right students for a program? Are mandatory, all-member presentations with motivational speakers, an effective and efficient culture-change approach? Is increasing the number of students you reach in a presentation more important than getting the right students for creating change? If the answer to any of the previous questions is, “no,” shouldn’t we be searching for a solution? For five years, we searched for the answer and we believe SNA is a critical component of the solution. Paluck, P. L., Shepherd, H., Aronow, P. M. (2016). Changing climates of conflict: A social network experiment in 56 schools. Proceedings of the National Academy of Science, 113(3), 566-571. Simpson, J. a, Farrell, A. K., Oriña, M. M., & Rothman, A. J. (2015). Power and social influence in relationships. In M. Mikulincer & P. R. Shaver (Eds. ), APA Handbook of Personality and Social Psychology (Vol. 3, pp. 393–420).